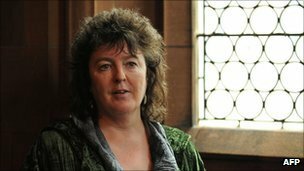 Poet laureate Carol Ann Duffy says texting is a modern form of poetry and an ideal vehicle for the Facebook generation. “The poem is a form of texting… it’s the original text,” Duffy said in an interview with the Guardian. Duffy is launching a competition for secondary school pupils, who will be invited to write their own anthologies. Entrants can be groups or individuals. They will be given a budget to work with, and the aim is to encourage a stronger relationship between children and the world of poetry. The deadline for entries is 1 March 2012 and the winning anthology will be announced three months later. The winner will be chosen by a panel of judges including Duffy, Liz Lochhead, the Scottish makar (national poet), and Gillian Clarke, the national poet of Wales. Their anthology will be published by Picador, and Duffy will visit the winning school. She told The Guardian she was passionate about placing poetry at the heart of the school curriculum because school was the first place she was introduced to poetry. Duffy, who became the first female poet laureate in 2009, added: “The poem is the literary form of the 21st century. This entry was posted in LITERATURE and tagged Carol Ann Duffy, facebook, modern poetry, poet laureate, texting by mabokov. Bookmark the permalink.